Now you can take the comforts of home, such as lights, radio or a small television, along with you when you are on the road, camping or in another remote location where traditional power sources do not reach. During the day, the DC solar powered lighting system uses the energy of the sun to charge its batteries so that when night falls it is ready to provide the energy you need. Because these systems are easy to transport, they are ideal for portable and travel solar energy applications such as camping, RVing or as an emergency power system. When you are ready to take the DC solar powered lighting system along with you to your next location, all you have to do is simply fold the system up and tuck it away in its case and you’re on your way. These systems even have wheels, so that if it is easier you can simply roll the system along. A 12 volt battery, two fuses, battery clamp adapters, a universal adapter, and two DC lighting adapters are included with these systems. Another benefit of the DC lighting system is that they are durable, and can stand up to the rigors of everyday use and abuse without damage. Best of all, though, these systems are both economical and environmentally friendly. The energy of the sun is free to use, so utilizing solar energy products such as this DC Solar Lighting System will cost you nothing. Because solar energy products do not require conventional electricity, they can save you a good deal of money on your utility bills. A portable solar system, such as the DC solar lighting system, can save you the cost of batteries for electrical appliances to use when on the road, or from having to pay the electric connection fee at a campground or RV park. And, since solar energy is clean, and renewable, these systems are great for the environment, lower your carbon footprint, reduce greenhouse gas emissions and help fight the use (and depletion) of natural resources and fossil fuels. When on the go, or in remote locations, it is often a necessity to go without the comforts of home, such as lights, radio, television, etc. However, the DC solar lighting system uses the energy of the sun to charge its internal battery pack during the day, and then, at night, this stored power can be used for lighting, or providing electricity to other appliances, such as a small radio or small television. This system will not provide enough power for larger appliances such as small refrigerators, fans, air conditioners, or others (though larger PV systems (even portable ones) can). The DC solar lighting system is extremely portable, making it ideal for travel and portable solar applications such as camping. When you are ready to move to a new location, the system easily packs back into to the rugged metal case, which can fit easily in a small space such as a closet in your RV, or the trunk of your car. The system’s case even has wheels, making it far easier to move the system along with you, no matter where your final destination is. 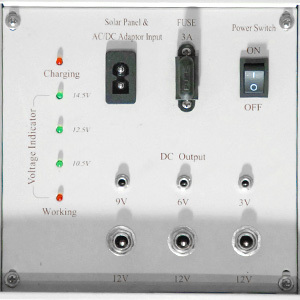 The DC solar lighting system includes: a universal adapter, battery clamp adapters, two fuses, two DC light adapters and a 12 Volt battery. With a DC solar powered lighting system, you can enjoy modern conveniences even when you are traveling or in remote locations. These systems allow you to take energy for lights, radios or television along with you.. Best of all, these systems will not harm the environment. The energy of the sun is clean, renewable, and free to use! Interested in learning more? Check out our DC Solar Powered Lighting Systems here.